The cartilage in your knee is a firm, rubbery, and very smooth surface. There is cartilage on the ends of the bones of your knee. Cartilage acts as a cushion to protect the bones from impact. Cartilage also allows your knee to glide and bend easily without pain. Injuries to the knee can cause also damage the cartilage. If the cartilage in your knee is severely damaged you can develop a hole or defect in the cartilage which could lead to a cartilage defect or hole in the cartilage. In active athletes of all ages, cartilage defects might require a repair to minimize the risk of developing arthritis. 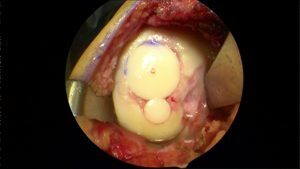 This post covers the most common procedures we used to replace or repair cartilage defects in the knee. Have you been told that you are “missing cartilage” in your knee? The inner side of the knee or the medial femoral condyle is the most common area for a cartilage defect. Given its location, these are also the easiest cartilage defects to repair. In the human knee there are two forms of cartilage. First, we have the two cushions, each of which we call a meniscus. We also have cartilage on the end of the thigh bone or femur, and cartilage that covers the top of the shin bone or tibia. This cartilage is known as articular cartilage. Damage to the articular cartilage will be the focus of this post. If you have been told that you are “missing cartilage in your knee” your physician is likely referring to the articular cartilage on ends of the bone, and not the meniscus. If you have been diagnosed with a “cartilage tear” your physician was probably referring to a meniscus tear. 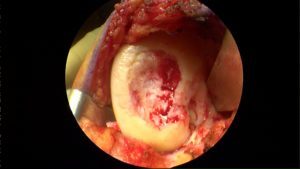 If your physician says you have a hole or defect in your cartilage, they are likely referring to the “articular” cartilage layer. The articular cartilage is typically 1/8-1/4″ thick in an adult knee. It is a firm, exceptionally smooth surface and enables your joints to glide and move without friction, grinding, catching or discomfort. The picture above shows normal appearing cartilage on the end of the femur and the top of the tibia when viewed during an arthroscopic knee surgery. Injuries to articular cartilage can occur in many ways. Many injuries occur in teenagers involved in track and field, soccer or football. Sports injuries can cause a piece of cartilage to literally shear off the end of the bone (see the image below). Cartilage injuries are not common, but they will produce pain, swelling, locking, and a feeling that something is loose within the knee. By far the most common cause of injury is the result of blunt trauma such as a fall from a height, a fall directly onto the front of the knee or a car accident where the knee hits the dashboard. In certain situations, osteoarthritis will cause defects or holes in the cartilage too. Osteoarthritis, by definition means that the cartilage on the ends of the bone is becoming thin due to degeneration. If you lose a little cartilage, that is mild arthritis. If you loose all the cartilage, you have severe arthritis. This post deals with defects or holes in the cartilage due to sports and injuries. Cartilage loss due to osteoarthritis will be covered elsewhere. upper picture you can see the cartilage literally peeling off of the bone. This is an acute or fresh cartilage defect. The picture below shows that scar tissue has tried (ineffectively) to fill a chondral defect that has been present for months. Cartilage injuries can be problematic, because cartilage loss can lead to knee osteoarthritis. Cartilage defects, if large enough, are best treated as soon as they are recognized. To see if a cartilage defect is present, an MRI is usually necessary. An MRI is very useful to demonstrate the location, size and repairability of a cartilage defect in the knee. Once the diagnosis is made,your surgeon can discuss the various techniques available to “repair” the defect in the cartilage. We have many good procedures to help restore knee cartilage, but none of them are perfect and some are more invasive than others. 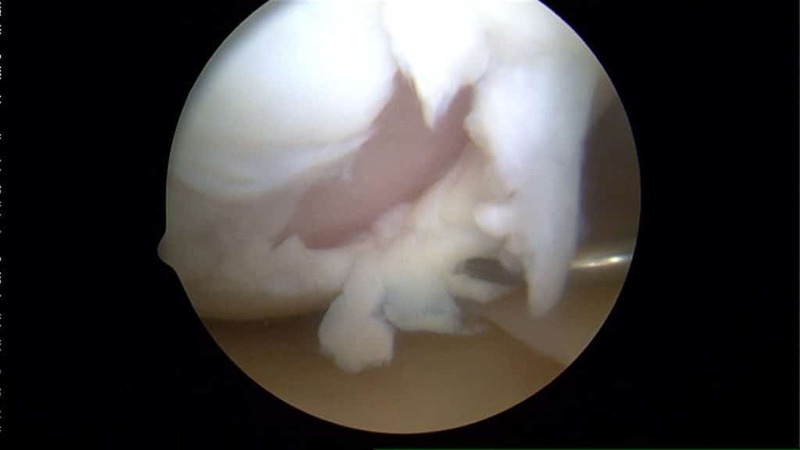 A Micro-fracture or “Marrow Stimulating Technique” is an arthroscopic technique and involves making many small holes in the cartilage hole or defect. After the holes are made bone marrow cells, stem cells and blood will come out of the holes and coat the cartilage defect. Theoretically those new cells in the knee will grow within the hole in the cartilage and result in healing. Healing occurs with a repair cartilage called fibrocartilage. Fibrocartilage is not the same as the original hyaline articular cartilage. It has different properties and might not stand the test of time. Genzyme developed a procedure known as Carticel. This involves two procedures. 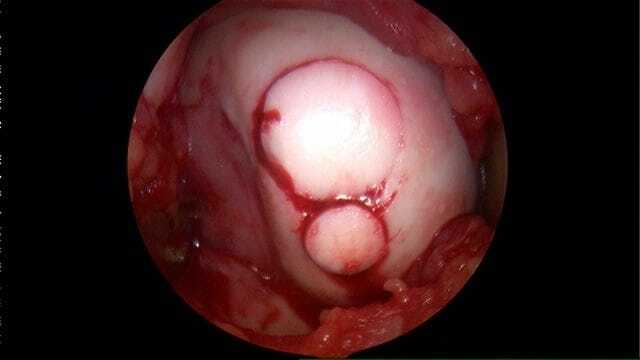 The first is an arthroscopic assesment of your defect and if we believe you are a good candidate for a Carticel procedure, we will take a small biopsy of normal cartilage. Genzyme will amplify, or grow the cartilage cells and send them back to us. During a second stage procedure those cells are implanted under a patch we sew over the hole in the cartilage. A MACI procedure is similar to an ACI or carticel procedure. There is an important difference. After the company grows your cartilage cells the cells will be implanted into a membrane which we glue into the cartilage defect. This shortens the procedure time and should result in a more uniform cartilage repair. Research studies show that this procedure generally produces a more “hyaline like” cartilage, or a more normal type of cartilage. The DeNovo technique has gained a lot of attention recently. The initial results being published are promising, but not a guarantee of success. The DeNovo technique involves implanting immature cartilage cells into a defect or hole in the cartilage and covering it with a biological glue. This is an open procedure. The DeNovo technique is discussed in more detail here in a separate post. Cartilage Grafting or Cartilage Transplant procedures is sometimes referred to as a moscaicplasty. I find this to be one of the more satisfying and successful procedures for fixing large cartilage defects in the knee. A cartilage transplant or grafting involves taking cartilage from a cadaver and transferring it to fill the cartilage defect in your knee. One of the advantages of a cartilage transplant is that we are placing living, firm articular cartilage into the defect. Below are images from two different patients. In both instances you see the cartilage defect in the image on the left, and then the end-result after the defects were filled with a cartilage transplant to the right. After most of these procedures you will need to be on crutches for a number of weeks. The amount of time on crutches will vary depending on this size of your cartilage defect, the location of the defect and the procedure you had. Physical therapy and range of motion activities are typically started soon after surgery. Cartilage nutrition and healing is actually improved by moving the knee. Depending on the procedure you had it might take 8-12 months for a complete recovery. Cartilage transplants or allografts tend to heal faster. Many athletes and weekend warriors will be able to return to sports after a successful cartilage repair. Traumatic cartilage defects are not very common injuries, but they can have significant consequences if they are untreated. Large defects can lead to osteoarthritis. Technology is improving in this area as our understanding of cartilage improves. 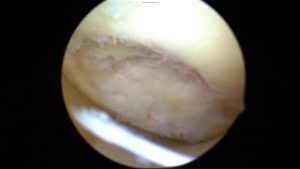 Many cartilage defects are now amenable to one of the various techniques that we reviewed in this post.